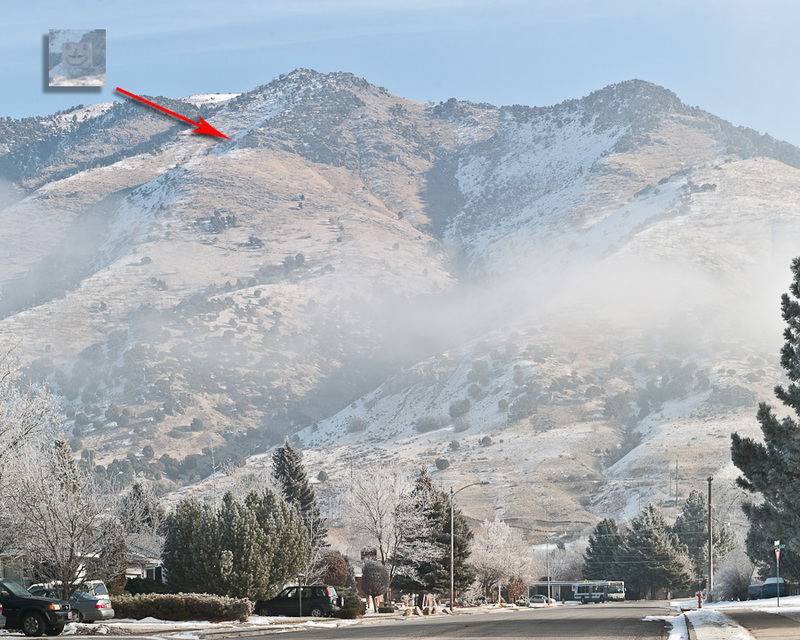 This past summer as a new resident to Cache Valley someone pointed out to me a passive repeater above Logan that had been painted with two eyes, a smile and a mustache. It’s one of those things that once I know it’s there I’m either seeing it or looking for it. As it happens this object is about 3/4 mile away and 1,500 feet above where I live. 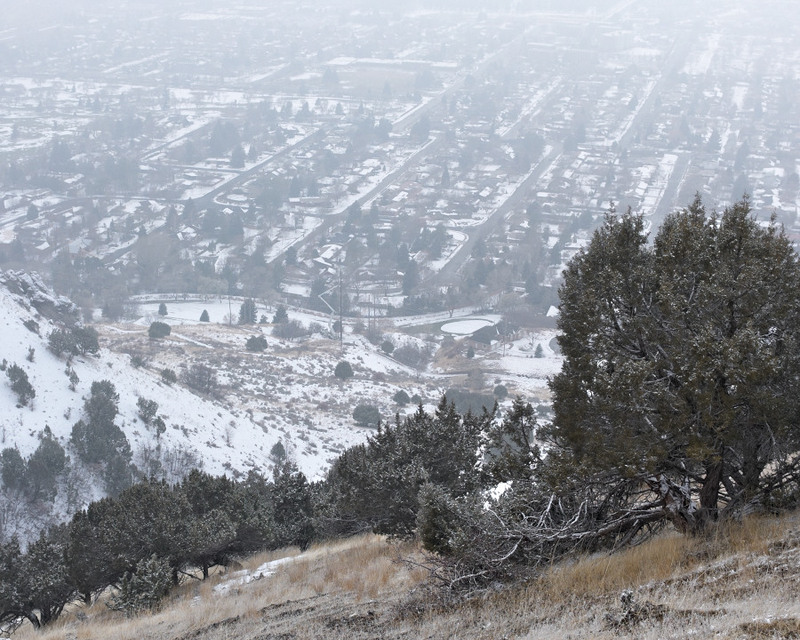 The repeater is on Saddleback Mountain on the Eastern side of Cache Valley in Northern Utah near the USU Campus and the mouth of Logan Canyon. This smiling radio reflector with the ironic mustache has been challenging me to go visit it and see what it’s all about. For whatever reason things like this attract me. Possible reasons include; because it’s there, it looks different and someone else climbed up there. Deeper thinking reveals reasons like; being subjected to the landscape of post industrial Akron Ohio as a young artist I have a predisposed interest in scraps of industrial hardware cluttering up an otherwise pristine landscape. Maybe it’s as simple as the fact that it looks really cool and is a popular subject / object in contemporary landscape photography that I participate in. Whatever the reason, I decided that a cold grey and foggy day in December would be the day I made the trek. Ever since the thought of going up Saddle Back Mtn. to visit the smiling reflector I have looked for possible routes with no obvious conclusions. The only thing to do was just do it. The first section of the hike was following game trails out of a wash on the Bonneville Shoreline Trail. Very steep with loose rock everywhere. The game trails look easy to follow from below but you quickly realize the advantage 4 legs and pointy hooves. Once past this steep area the land leveled off in an area of burned out Juniper. It is here that I came upon a group of deer about 30 strong. Needless to say we were both surprised. Being a fan of the Mule Deer I stopped for sometime and watched them before taking out my camera to photograph them. Not wanting to scare them away, after all I’m in their neighborhood, I altered my route and walked slowly as I wanted to get closer for some more pictures. Looking up into the fog above I tried to figure out the best possible route up the increasingly steep mountain side. Unlike the beginning of the hike, the Juniper in this area were all dead and weathered due to a fire a few years ago. So in addition to the steep incline and loose rock now I had to figure the best way through fallen down Juniper. I might add that at this point I am in the fog bank with just a few hundred feet of visibility. Looking up to my destination, nothing but white. Looking back where I came from, nothing but white. 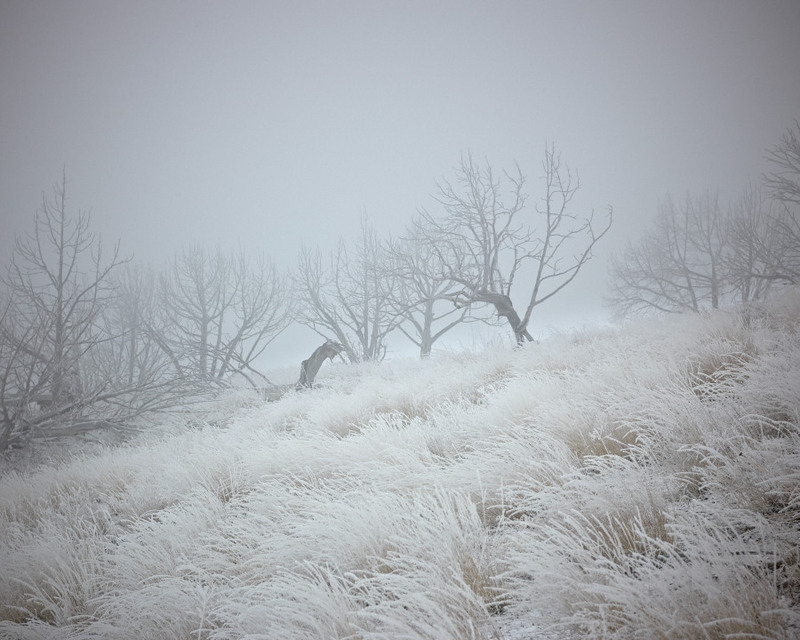 At this point the hike started to take on a sublime feeling with fog above and below, hoar frost with really large crystals on plant surfaces and feeling that I was being watched. After carefully checking my surrounding for any critters that may be watching I pressed on up the mountain into even thicker fog. From my research looking at maps and Google Earth I knew that I may be getting close to the destination. However with the fog who could tell. Something about the density of the fog in front of me gave me hope that I might be close. As I stood there I could just barely make out a strait vertical edge. Something man made in the fog. Then it disappeared. With the optimism that I was close I moved forward through the thick fog. Eventually things cleared just enough to confirm my suspicion that this was the reflector I was searching for. The ground quickly turned to compacted snow about 12 or so inched deep as I neared my destination. Success! So there I was in front of the large smiling reflector with the ironic mustache. The object I had focused on for the past few months was now less of a mystery. As expected, I found a good bit of graffiti on the backside of the reflector. Names and dates of others who made the trek. Most of whom I’ll guess were teenagers from Cache Valley. I’d like to thank Cody who visited on 10/14/10 for the fine job he did writing his name on the rock outcropping directly behind the reflector. Your work really adds to the experience. Who knows, maybe Cody’s fine signature will inspire others to make this place look like the rocks at the base of Parlays in Salt Lake City. Personally I hope not. Checking the time I figured I had over an hour before it would become dark. Not knowing how long it took to get here was a minor concern, but then going down is faster. Well, yes and no. It seems the fog had become a bit thicker for one then there is the issue with all that loose rock. Just watch your step and you will be fine. Since this whole hike was a bush whack there is no defined return path. So time to start picking a route. Not as easy as it seems as the way down presents its own issues. Since you are moving faster it’s much easier to slip so you need good footing (assistance from a good hiking staff helps too). The terrain looks different too. The chute I was following at one point became filled with a thick fog a totally disoriented me for a few minutes and I had to backtrack a bit. Being able to keep it together and being rational helps in those stressful moments when you think you are lost. In my case the thick fog gave me doubt of where exactly I was and how much time had passed. I had to force myself to go back and follow my intuition of where I had come from on the way up and not just react to what I was seeing visually. After maybe 50 yards I recognized my original route. 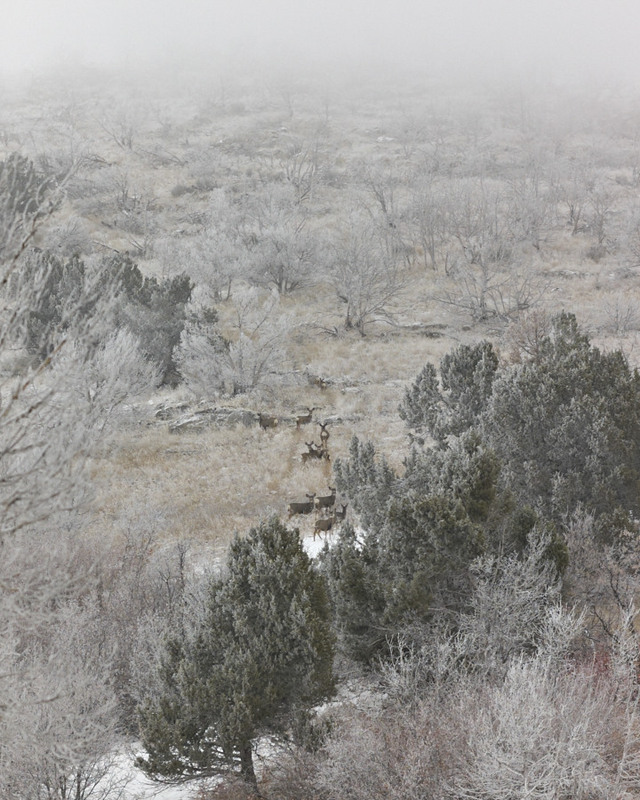 The Mule Deer were still in the area and the fog was thinning so I could now see a much greater distance. Relief. After spending some time watching the deer I started toward my final decent to the Bonneville Shoreline Trail. From my location I was treated to a scene that reminded me of the Bruegel painting The Hunters in the Snow. Stopping to take this in was a treat. So much to see from this elevation. The last part of the hike was just as bad as the first part now in reverse. Very steep and very loose rock. I took as fast a necessary and as slow a possible. This area required thinking out the route carefully and throughly. In the future I’ll find a route that bypasses this area. In conclusion this little trek was 3/4 mile one way with a 1,500 Ft. gain in elevation. 100% bushwhacked and 100% worth it. Parts were literally sublime. The natural world as beautiful and frightening at the same time. As I write this a day later SaddleBack Mtn. is still socked in with thick fog and I am planning my next journey. This time to the top and not one but two repeaters. 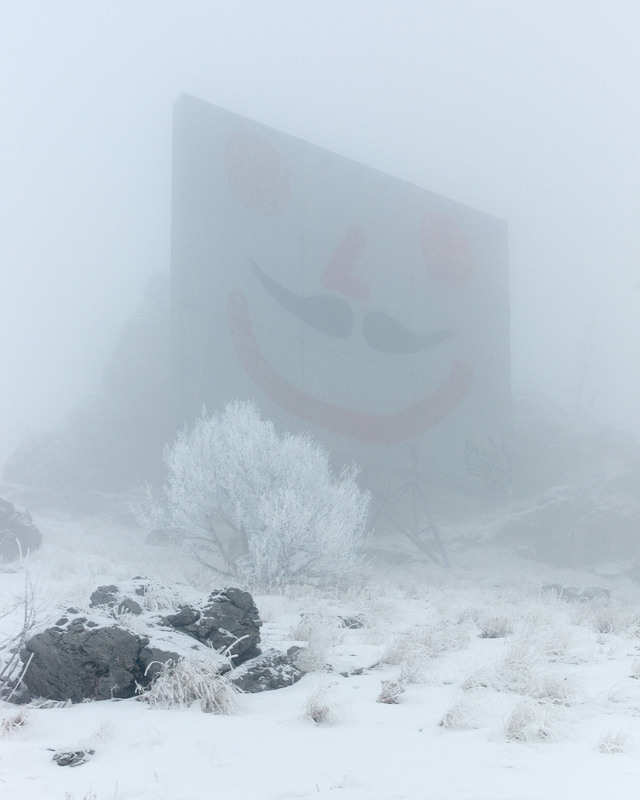 Update: As of June 2012 the smiling passive repeater has been removed from the mountain. A great story, best experienced vicariously. Thanks for taking me there without making me climb. What beautiful pictures. Thank you so very much. Since my wife and I are both confined to our homes, we really miss traveling and seeing the beautiful sights of creation. What is it with you and fog! It makes for very atmospheric photos, but I like to see the long view! About to embark on a photography course in May and can’t wait! Very interesting? I’ve wondered about those repeaters ever since I was a freshman Aggie in 1977. Thirty years later, bringing my oldest daughter up to follow in my USU footsteps, I almost had my youngest son convinced that the two on top were a drive-in theater.